A guy walks into a pawn shop…. And walks out with what he believes to be a snub nose .38, for personal and home defense. What he comes home with, however, isn’t quite what he thought it was. Not only is it not .38 Special, but it’s in a much shorter, and hard to find caliber: .38 Smith & Wesson. Perhaps not what he was looking for after all! What we’ve got here, is a 1935 Enfield No.2 Mk.1, with a barrel cut down to 2″. Some history on the Enfield revolver. 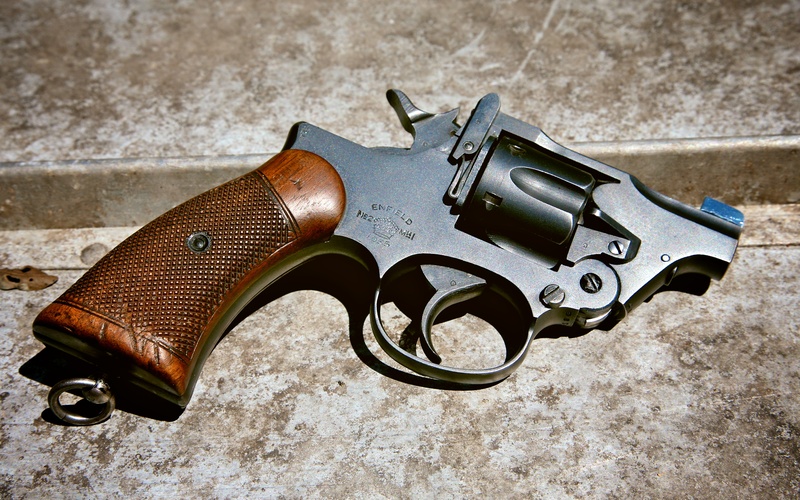 The No.2 Mk.1 was adopted by the United Kingdom and British Commonwealth in 1931, with an external hammer, fired from both Single Action and Double Action. (SA/DA). In 1938, supposedly by the request of tank crews who kept getting the hammer snagged onto things in their confined battle stations, the No.2Mk1* was introduced, with a Dual Action Only trigger, and a spurless hammer. In War time, most Mk.1 models were converted into Mk.1*, refitted with a different hammer and trigger mechanism. At some point or another, a snub nose model was fabricated, based on the No.2 Mk.1*. The barrel was cut to 2″, and the top of the remaining barrel was machined down, and the sight base and blade from the original model were soldered on. 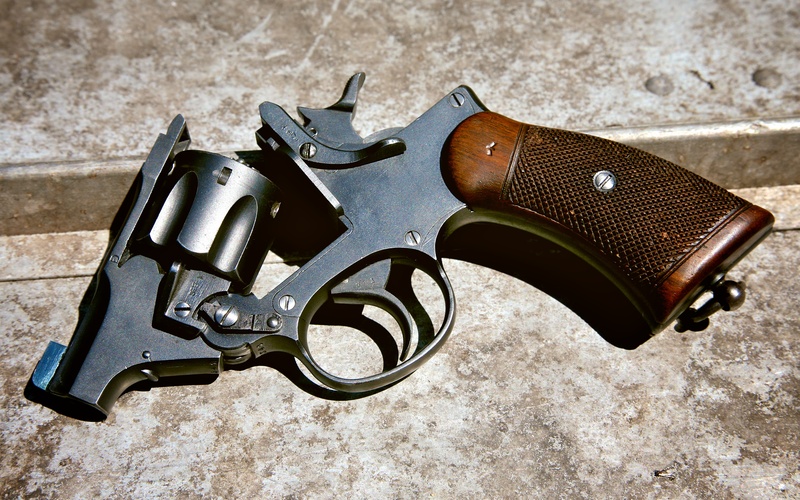 The modification almost unnoticeable by the untrained eye, the revolver seemed as if it was made that way. 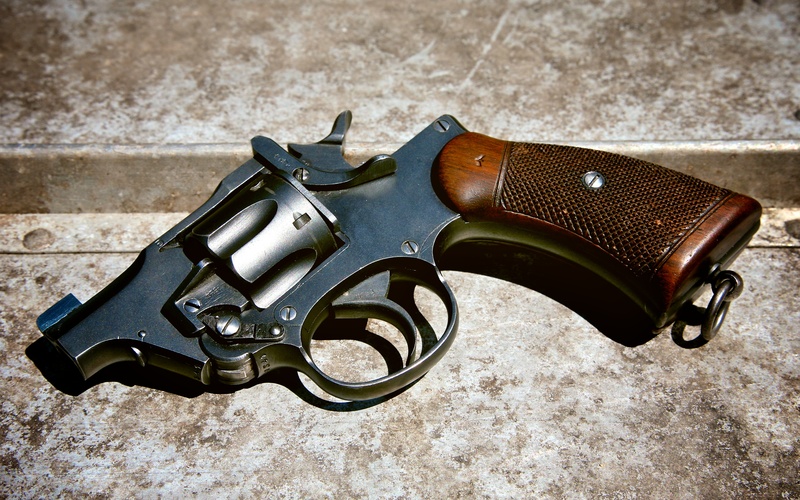 Supposedly a handful of revolvers were modified, and the project was stopped. Few of these snub nose models remain in the UK. The gun we have here, was a relatively common sight in the ’60s in the US, Enfield revolvers were imported by the bunch and sold by mail order companies by the dozen, and were cheap. To boost sales, few resellers cut down the fine No.2 Mk1* models and soldered a blade on the end for a sight. The interesting thing seems that the modified ones offered at the time were all Mk.1* models, and not Mk.1 models like this one. Whoever did the modification butchered up a fine revolver, but at least spent some time fabricating and installing the sight. In the right light and clearly visible in the pictures, the difference in bluing is noticeable, and some traces of solder can be seen. Nonetheless, a nice piece of work. Is it rare? Not really. Is it valuable? Not really. One thing is for sure though; It’s a neat old thing!